Disruption to metal homeostasis is a clear and common feature of several debilitating neurodegenerative disorders. Over the last couple of decades significant advances have occurred in our understanding of biological metal homeostasis, particularly for the three most abundant metals, iron, zinc and copper. In contrast, despite having a requirement for these metal ions it is not clear how the brain controls and mediates uptake and distribution. However, it is emerging that a key component in metal homeostasis is glial cells, particularly astrocytes, and particularly those that interact with blood vessels and neurons. 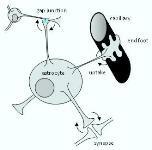 Astrocytes are known the help regulate the biochemical environment of the brain and are likely to assist in metal homeostasis. The use of metals in the brain (particularly copper and iron), the neurologic diseases that feature disrupted metal homeostasis and how astrocytes play a not insignificant role in metal regulation are the focus of this review.